The Bible is very clear on who God is, and how He views people and nations. God has never changed. He is the same yesterday, today, and forever. Those who obey Him are blessed, and those who turn from Him are cursed. What is the living God saying to the people of America now? What is in store for the nation of America, a nation that once trusted in God, that has changed its path from following in the living God’s ways to now removing Him from everything and walking the other way? What is in store for a nation so determined to reject the God who so completely blessed it? In this audiobook, you will hear 35 prophetic messages and five detailed open visions from the Spirit of the Lord to the people and nation of America. Find out what is in store for the once great and mighty nation of America in these end times. The Judas Test: Can You Pass the Test of Absolute Betrayal? 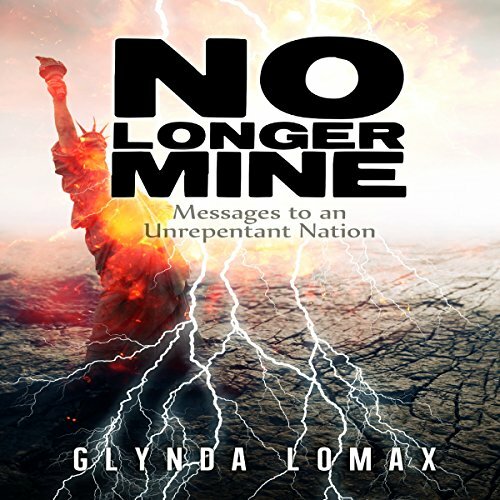 The book No Longer Mine by Glynda Lomax is an excellent book and should be heard by every Christian and non believer. I really enjoyed listening to the Words from the Lord because it was a good reminder of what God expects of His people as far as holiness and righteousness. It is good to read the words from the Lord, but when you hear them it takes it to another level. Hearing it brings to the forefront the seriousness and the soberness of the messages the Lord has given Glynda. Hearing this makes you want to stay close to the Lord and be obedient when He speaks because it is apparent time is running out and the Lord is going to return and judge the world. One thing that stood out to me was how through these words the Lord was pleading with America and His people to follow in His ways because of His great love for us and because he knows the terrible consequences sin will bring if we do not change our ways as a nation. Glynda is a woman of God who fears the Lord and she wants to be obedient to all the Lord asks of her. Glynda is someone who loves people and wants to see them come to the Lord and find the same love and acceptance the Lord has offered to us all who repent and come to him. The narration in this book has a way of captivating the listeners attention because you can feel the presence of the Lord when he speaks and the great urgency that Glynda felt when hearing these words from the Lord is still felt today. I would recommend this audio book to every Christian who loves the Lord. It will help them realize the lateness of the hour and how vital it is to share the Gospel with the lost. Many prophetic voices are sounding warning alarms to America at this time and some may feel all of this is just an early wake up call. This book will change that misconception. Glynda Lomax has been receiving powerful and painfully revealing prophecies from Father God for a number of years and this book documents them as far back as 2010. With all of the prophecies she receives she is also given scriptural references that emphasize and clarify what has been spoken by the Holy Spirit to her and through her. Anyone seriously interested in what the Spirit is saying unto this nation should read this book, then pray earnestly for the lost, this nation, and themselves. We are running out of time and need to hear these messages and wake up.